Now we’re not one for taking short cuts or the easy way out, but in a world where content marketing is king, tools that will make your life easier and create engaging, dynamic content are a precious commodity. These 7 content creation apps will blow you away with their easy-to-use interfaces and high-quality results. Create professional designer quality graphics right on your phone. From Pinterest to Twitter, to blog graphics, and Facebook covers, Canva provides thousands of platform specific templates that you completely edit. Upload photos and edit the font, copy, and layout. Subscribe to Canva for Work and upload your company’s fonts and colours. Create on-brand templates that you can reuse to ensure consistency. Created by Instagram, Hyperlapse helps you create time-lapse videos that are typically shot using a tripod over a period. When you shoot your video in the app, Hyperlapse stabilizes the video making it look seamless and professional. Edit the speed and length to your desires. Time-lapse video content is ideal for showing behind the scenes or creative processes in quick, engaging videos. Adobe Spark is the umbrella of amazing Adobe created apps including Adobe Spark Video, Post, and Page. Create social graphics with Spark Post. Upload an image. Add and edit your text and save it in all the different dimensions of each social platform. Create web pages with Spark Page, choose a template and add photos and copy. Use Page to create your newsletter or next blog post. Use your videos and images or preloaded graphics to create seamless, yet straightforward video content with Spark Video. Add text overlay, music, and a personalized voice-over. Spark Video is great for tutorials, a new product launch, or simply telling a story. Without the use of advanced photo editing programs like Photoshop, layer, mask and Superimpose images and change backgrounds with Superimpose. The super easy to use interface is straightforward with all the tools from lasso, brush, to hair refining that make enhancing and altering images simple. Add text and artwork to your images with Over. With tons of fonts, font styles, colors, and other text functions like shadow, opacity, and spacing, you can create beautiful graphics with a clear message. Search for stock photos, use your own, or even search Google for images and add them to your canvas. Size your graphic with platform specific dimension options. Create inspiring graphics by adding text to an image with WordSwag. Choose from their variety of designed fonts and typefaces or create custom text layouts. Insert your text or scroll through hundreds of captions, quotes, and jokes. Create blog graphics. Add your logo and text to images. Legend lets you create engaging content by animating text on your images, videos, or simple backgrounds. It’s as easy as adding text and choosing from their animation, colours, and text styles. It animates in real time so you can watch your text transform. Choose from square or landscape dimensions for easy social sharing. There is no excuse for boring, monotonous content. 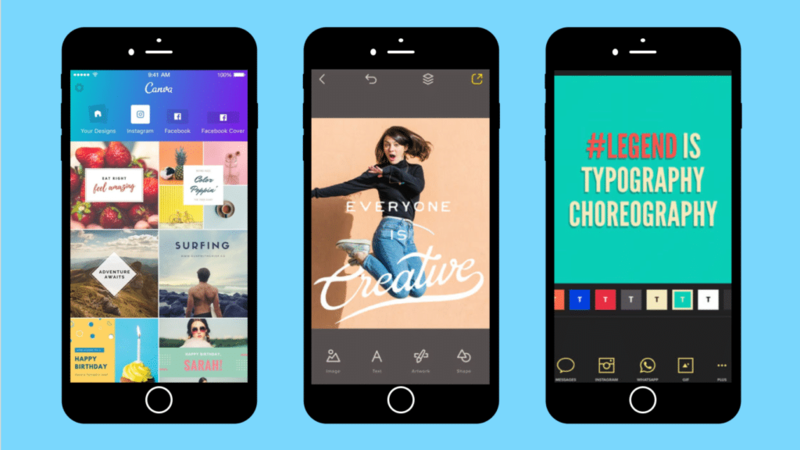 These apps are as close as you will get to have a graphic designer in your pocket. Great shareable content doesn’t have to be laborious and time-consuming. A little creativity and some help from these useful apps will have you creating engaging content that will leave your community inspired, educated, and left wanting more. Looking to up your social media content game? Book a free consultation call today with a marketing specialist!